Ask A Huntington Hills MARKET EXPERT! DESCRIPTION This wonderful bungalow is situated on a quiet street in sought after Huntington Hills. Recent updates include new shingles, windows, laminate on main floor, new baseboards, light fixtures & eavestroughs. Functional floor plan offers huge living/dining room combo with an updated kitchen with loads of cupboards and countertop space. South front exposure allows for plenty of natural light throughout the home. Master bedroom comes with an en-suite bathroom, 2 more bedrooms & a 4pc bathroom complete the main floor. Basement is fully finished & it comes with a huge rec room, 4th bedroom, den/office plus a 3pc bathroom. This home offers a detached single insulated garage, high efficiency furnace, central vacuum system, wooden window shutters & concrete patio in the backyard. Pride of ownership shows throughout. Easy access to major routes, shopping, schools, playgrounds and most amenities are at your fingertips. Ideal location with great value, this home won't disappoint! 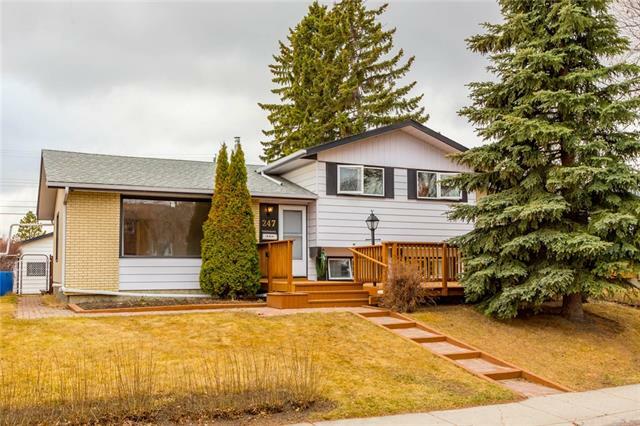 467 Huntley WY Ne, Calgary, Alberta, MLS® C4233425 T2K 4Z7 is a Detached, 5 bedrooms, 3 bathrooms, approximately 1,144 Sq. Ft. Listing price 445,000.00. This property was built in 1972.